The Washington Post’s Zachary A. Goldfarb penned a blog post this week arguing that taxes on the middle class look destined to rise, in order to sustain additional spending on research and development, paid family leave, and other federal programs. But his analysis misses several key points: Taxes are already going up on the middle class—and raising them further won’t solve our fiscal woes. Obamacare also stretches the definition of “middle class,” by failing to index its “high-income” tax for inflation—meaning more individuals will be ensnared by this tax every year. The nonpartisan Medicare actuary concluded that, while only 3% of households were subject to the tax in 2013, nearly 79% will be by 2080. For these and other reasons, Politifact has said that the president broke his campaign promise not to raise middle-class taxes. If you look at the numbers, then Medicare in particular will run out of money and we will not be able to sustain that program no matter how much taxes go up. I mean, it’s not an option for us to just sit by and do nothing. Those words were spoken by none other than Barack Obama, in a July 2011 news conference. So while Mr. Goldfarb says that “it’s hard to see a way to preserve the nation’s entitlements without raising taxes further,” the reverse scenario is more accurate: Medicare needs significant reforms, regardless of whether taxes go up, down or stay the same. Mr. Goldfarb is well within his rights to call for higher taxes on the middle class as a way to fund additional federal spending. But the facts are clear: The middle class is already absorbing higher taxes due to Obamacare—and higher taxes won’t solve our fundamental fiscal shortfalls. As the president himself might say, that’s not class warfare; that’s math. A Wall Street Journal story Thursday analyzing premium patterns for the 10 states that have released 2015 health insurance rates concluded that some consumers might benefit from switching plans during open enrollment this fall. It also revealed a dilemma for the Obama administration: Making renewals easier for consumers may cost consumers more money. Because federal premium subsidies are tied to the second-lowest-priced “silver” plan on each exchange, shifting rates could surprise some consumers. For example: Say Insurer X gained a large market share in 2014 by submitting the second-lowest silver plan premium, at $250 per month. In 2015, then, other insurers might lower their bids to attract market share, keeping the state’s second-lowest silver plan at $250 per month. But say Insurer X proposed a 10% rate increase, to $275 monthly. Under this scenario, consumers who stick with Insurer X would pay the full cost of the 10% rate increase ($25 per month). Federal premium subsidies would not offset any of the higher premiums. So it’s possible that individuals with a subsidized premium of $50 per month in 2014 could face a 50% increase in net premium costs (from $50 per month to $75) by remaining with their current insurer. The Journal article noted that the administration has not yet announced “the re-enrollment process for people who bought coverage in 2014.” That’s because the administration faces a double-edged sword: Making reenrollment easier could result in premium increases for many individuals, particularly because the most widely subscribed plans have proposed significant rate hikes. On the other hand, requiring those who are enrolled to start over and repeat the process increases both the likelihood that enrollees will switch to a cheaper plan and the risk of a technical debacle similar to Healthcare.gov’s launch last fall. Whatever decisions are made about the reenrollment process, the administration’s choices are likely to have ramifications for insurers, individuals, taxpayers and perceptions of the law generally. In a Think Tank post Thursday, I wrote about how insurers deciding to participate next year in the health exchanges established under Obamacare could be expecting funds that the federal government may not have legal authority to disburse. But that’s not the only potential pitfall for carriers: They could also end up on the hook for payment reductions caused by sequestration. In the spring of 2013, the Obama administration submitted a report to Congress indicating that, while subsidies for health insurance premiums on the exchanges were not subject to the budget sequester, the separate program of cost-sharing subsidies—reducing deductibles and co-payments for certain low-income individuals—faced a 7.2% cut in fiscal 2014. Marilyn Tavenner, the administrator of the Centers for Medicare and Medicaid Services, confirmed this position during congressional testimony last August. In a March report to Congress, however, the administration said that both the premium and cost-sharing subsidies were exempt from the sequester. Last month, in response to questions, Sylvia Mathews Burwell—then the head of the Office of Management and Budget, now the secretary of health and human services—told several senators that the cost-sharing and premium subsidies “will be paid out of the same account” as a way to “improve the efficiency in the administration of the subsidy payments” and that payments from that account are exempt from the budget sequester. The problem with this? That’s not what the law says. As I pointed out last October, the premium and cost-sharing subsidies were established in two separate sections of Obamacare. The premium subsidies are codified in the Internal Revenue Code, which is administered by the Treasury Department and payable to individuals. The cost-sharing subsidies are codified in the Public Health Service Act, which is administered by the Department of Health and Human Services and payable to insurers. And while the premium subsidies are structured in a way that should exempt them from the budget sequester, the cost-sharing subsidies are not. The administration appears to be using efficiency arguments to try to shield the cost-sharing subsidies from the sequester. But the sequester is a zero-sum proposition, so exempting the cost-sharing subsidies from sequestration means other programs would take a greater budgetary hit—and affected organizations or programs may have standing to challenge in court. The bottom line: The nonpartisan Congressional Research Service warned in May 2013 that insurers could be on the hook to absorb the billions of dollars in sequester cuts to the cost-sharing subsidies. As with the “risk corridor” provision of Obamacare, insurers participating under the assumption that these legal questions will be easily resolved may be doing so at their own risk. 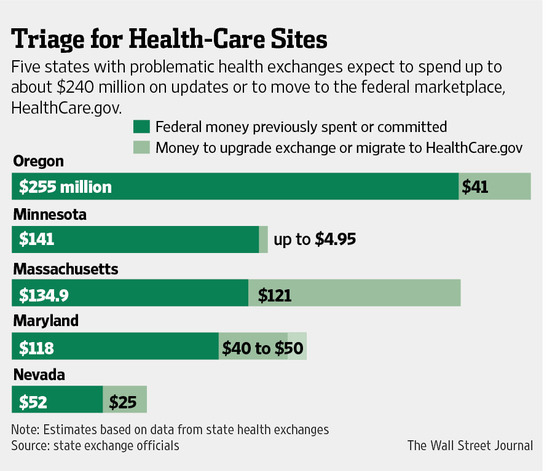 Are the Obamacare Exchanges Attracting People in Poor Health? The Kaiser Family Foundation released a survey Thursday of individuals who have purchased health insurance during the first open enrollment period under the Affordable Care Act. The poll included a question about self-reported health status, the responses to which suggest that 2014 purchasers through the health exchanges may be less healthy than the broader population. According to the study, 20% of participants in exchange plans reported their health as being in “fair” or “poor” condition, whereas only 9% of those purchasing exchange-compliant coverage outside of the exchanges report being in fair or poor health. These findings tend to bolster an April Gallup survey finding that only 12% of those with exchange coverage rated themselves in “excellent” health, compared with 21% buying new coverage this year outside the exchanges and 21% for the U.S. adult population. The Kaiser study did not break out results by age, but the Gallup survey found that only 24% of exchange purchasers were ages 18 to 29, whereas 37% of people in that age bracket purchased coverage this year outside an exchange. The exchanges appear to attract a different clientele than non-exchange plans, but it’s not yet clear whether that is a first-year anomaly or a larger pattern. Provisions in the law that require insurers to treat their exchange and non-exchange plans as a single risk pool may mitigate disparities between the two markets. But if the insurance exchanges become the virtually exclusive province of the old, sick and those who qualify for subsidies, it is likely to have ramifications throughout the insurance industry and on Obamacare as a whole. As insurers submit bids for the 2015 open-enrollment season, media reports have trumpeted increased participation by carriers on several health exchanges. Depending on the legal and judicial interpretations of two important issues, those insurance companies may end up getting much more than they bargained for. The first issue involves the temporary “risk corridor” provision in Obamacare, under which plans with enrollees who are healthier than average pay into a pool that subsidizes plans whose enrollees are unhealthier than average. This was designed to provide stability for the first three years of the exchanges–2014 through 2016–as insurers became accustomed to a new marketplace. While some conservatives have focused on whether the risk corridors would be implemented in a budget-neutral manner and whether the program represents a “bailout” for insurers, a more fundamental question is: Does the Obama administration have the authority to implement this provision? A January memo from the Congressional Research Service raises doubts. The memo and manuals of appropriations law published by the Government Accountability Office provide the minute background, but the basic premise is simple: To spend money, Congress must pass legislation authorizing the executive to do X action and then also appropriate Y dollars for that purpose. But Section 1342 of Obamacare, which directed the Department of Health and Human Services to establish risk corridors, included no language appropriating funds for the program. (See Pages 108-109 here for the legislative language.) Because both conditions necessary to appropriate funds were not met, the risk corridors appear to exist in, at best, a legally murky area. A range of legal, judicial, administrative and political outcomes are possible. It’s worth asking whether insurers have taken the absence of legal authority into account when deciding whether to plunge into exchanges for 2015. Because it’s possible that some insurers could face medical claims from enrollees who are sicker than expected yet not have the backstop they expected when submitting their rates. Who Would Pay for This Medicaid Expansion? Even as states continue to debate the costs of expanding Medicaid under the Affordable Care Act, some in the medical field are proposing new commitments for the program. Last week Politico reported on a letter to Congress by several physician groups asking that increased reimbursements for primary-care physicians participating in Medicaid be extended. Low reimbursement levels in many states have led to low physician participation in Medicaid. The budget reconciliation bill passed just after Obamacare in March 2010 included payment increases for primary-care physicians participating in Medicaid—bumping up reimbursements to Medicare levels. But only two years’ worth of payment increases, in 2013 and 2014, were funded. With the temporary bump expiring soon, physician groups have asked for this provision to be extended for at least two years and be expanded in scope; under the broadened provision, obstetricians and gynecologists would qualify as primary-care physicians eligible for the higher payment levels. The proposal raises several questions, including whether states would cover any of the cost of extending the increased payments. The federal government fully funded the first two years of payment increases, but federal debt is now more than $17 trillion. Washington may decide that states should pay for some of what amounts to an average 73% increase in primary-care reimbursement levels. States considering whether to expand their Medicaid programs under Obamacare, and whether the federal government will honor its fiscal commitments for that program’s enhanced match, would be wise to watch the debate around this reimbursement bump. As with other costly Obamacare “fixes” for which advocates have not yet outlined budgetary savings, they could one day be on the hook for more than they bargained for. What’s “Success” in Lowering Health Care Premiums? Supporters and opponents of the health-care law disagree about a lot. When it comes to whether the Affordable Care Act is reducing health insurance premiums, they even disagree on the definition of success. Recently the Commonwealth Fund, a think tank that supports the law, released a paper on overall premium levels. The analysis by Jonathan Gruber, a paid consultant to the Obama administration on the Affordable Care Act, argues that premium increases routinely exceeded 10% before the law was enacted in 2010 and that Obamacare will help lower the scope of increases in future years. But during the 2008 presidential campaign, Barack Obama promised on numerous occasions that his plan would “cut costs” and “lower your premiums” by $2,500 per year for the average family. Ironically, the foundation for Mr. Obama’s promises rests in a memo released by three consultants to the 2008 campaign—one of whom, David Blumenthal, now heads the Commonwealth Fund. Supporters of the law started out saying that Obamacare would reduce premiums in absolute terms. Now, backers say that the law will lower premium increases relative to what they would have been without the law—a tougher metric to quantify and a more difficult measure of success to sell politically. This is another example of how in Washington, where one stands on an issue frequently depends upon where one sits. States trying to fix balky exchanges face technical and logistical problems—and two looming deadlines. The first is Nov. 15, the start of the open-enrollment period for 2015. The second, and perhaps more important, is Jan. 1—the date the U.S. Department of Health and Human Services loses authority to issue grants to states for their exchanges. Of course, the same arguments could be made regarding Obamacare’s Medicaid expansion. Despite a high federal match, expansion brings with it administrative costs—in the tens of billions, by a 2010 Heritage Foundation estimate—and state shares of spending would increase in future years. The Fiscal Survey of States underscores the squeeze Medicaid has placed on states’ other spending priorities. In fiscal 2013, states collectively reduced higher education spending by more than $1 billion, even as Medicaid outlays grew by nearly $500 million. It’s good that legislators, including supporters of the Affordable Care Act, are publicly recognizing the opportunity costs associated with greater state spending on health care. But it’s a debate that should have transpired years ago. An Associated Press story Wednesday detailing how at least 2 million individuals have data discrepancies in their applications for Affordable Care Act insurance subsidies provides another example of executive implementation gone awry. The issue lies with verification of income, citizenship and immigration status for those applying for health insurance subsidies. Legislation that reopened the federal government last fall included a requirement (Section 1001 here) for the secretary of health and human services (HHS) to certify that only eligible individuals would receive insurance subsidies. The 16-page HHS report complying with that requirement has more than a dozen pages of references to federal regulations, statutory requirements, government agencies and administrative processes—suggesting that taxpayer funds would be spent wisely. Except the processes weren’t ready at all. The Washington Post reported last month that the federal computer systems central to the verification process had yet to be built—meaning that verification documents sent in by Americans have been gathering dust. Wednesday’s AP story cited an administration official saying that about 60% of exchange applications with discrepancies remain in the 90-day window provided under the law to adjudicate disputes. The implication is that 40% of applications—or about 800,000 individuals’ paperwork—haven’t been resolved, and it’s not known when they might be. All this means that those Americans receiving subsidies in error—who may later be forced to pay back sizable sums as the verification process drags on—and all taxpayers, who will ultimately foot the bill for any fraud, could face nasty surprises in future months. Would Employee Choice Drive Up Health Insurance Costs? Obama administration officials recently released a document implying that allowing small-business employees to choose their health insurance policy could raise premium levels. That the 2015 Transition to Employee Choice would be in the best interest of small employers and their employees and dependents, given the likelihood that implementing employee choice would cause issuers to price their products and plans higher than they would otherwise price them. The form and certification relate to the small-business insurance exchanges implemented under the Affordable Care Act. The law was designed to allow employees of small businesses to pick plans from a variety of insurers (Humana, Blue Cross Blue Shield, Cigna, etc.). But technical delays associated with the botched launch of HealthCare.gov forced the CMS to postpone the rollout of employee choice. As a result, small-business employees in the federally run exchange this year choose only from plans offered by the insurer their employer picks—rather than any insurer offering exchange coverage. The CMS statement that expanding employee choice would cause insurers to raise premiums directly contradicts administration reports last year that the exchanges prove “market competition works.” It remains unclear what prompted this about-face. But given ongoing technical problems with the federal exchange, it’s possible that the CMS is attempting to dissuade states from participating in an employee choice program still not ready for prime time.